Dear All This February, we’re delighted to announce the launch of three incredible promos! 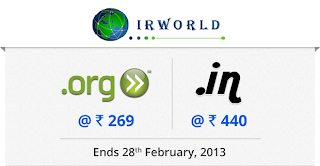 With these promos, you can get .ORG Domains at Rs. 269, .IN Domains at Rs. 440 & .ASIA Domains at Rs. 245! This Promo shall begin on the 6th of February, 2013. This promotion is applicable for new .IN Domains Registered for 1 year only. This Promo shall begin on the 5th of February, 2013. Hope you make the most of these promos!